Some of my kids have needed a little more support in the handwriting department than others. I’ve tried various products over the years, but haven’t found anything I really loved yet. 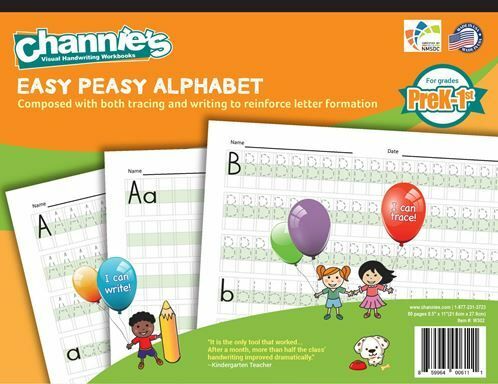 On my quest for a solid handwriting program, I was excited to review the Easy Peasy Alphabet from Channie’s Visual Handwriting & Math Workbooks. When I first flipped through the pages, I had to admit that Easy Peasy Alphabet was unlike any other handwriting book I’d ever seen. The pages remind me of graph paper, but with bigger boxes. The upper and lower case letter are both on the page, and students have plenty of opportunity to trace both. Tracing allows students to really get a feel for what the letter is supposed to look like. The repetition helps students begin to build muscle memory. They learn what it feels like to form each letter, and can use that memory to help when they’re no longer tracing. It has one visual reminder, and then plenty of empty grids for practicing. My original plan was to have Simon use this book. He is learning his letters and since it’s recommended for grades Pre-K-1, I thought it’d be a great fit. In the meantime, I thought about my kids and picked one who really needs some help in the handwriting department. Even though this child is over the recommended age, I’ve assigned a half-page each day. It only takes a couple of minutes each day, and I’ve noticed dramatic improvement in the spacing of letters. I was a bit skeptical at first. I thought the grid method would create too much dependency on a system that isn’t available in any other form. After all, when you buy a notebook at the store, you don’t get grids. You get lines. But, I was wrong. 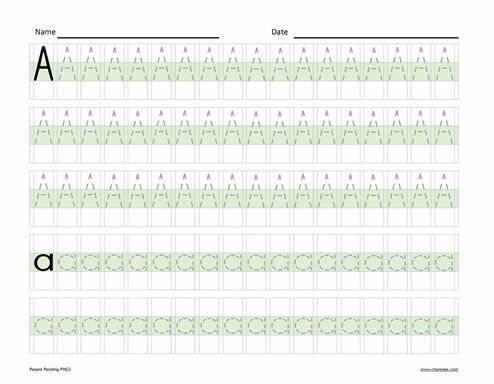 The grids help provide a visual reminder and it appears to carry over to lined paper as well. I think it allows students to easily visualize what letters should look like. At least it has for my student. Going from tracing to writing on the grids to writing without the grids scaffolds the child gently. I think I’ve finally found the solution to handwriting for my kids who need a little extra help. And since a couple of my kids are having a hard time keeping their columns in order when they do double-digit math, I’m planning on picking two of the One Page a Day: Double Digit Math Problem Workbook as well. Want to learn more about this and other products from Channie’s Visual Handwriting & Math Workbooks? Click on the banner below.